The latest discovery from the Bad Sector laboratories is simply astonishing: Massimo Magrini's new opus is born as a mutation of basic tracks recorded during the 1987-1996 decade which were given new forms in late 2000. 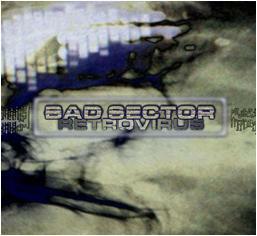 The inoculation starts with a re-generated track taken from the old "Pressurized Music" tape and proceeds with ten new short numbers that also explores some inedited ambient connections, then the infection is completed with the long closing track which was basically recorded during a live performance. Sound sources are surprising as usual in the best Bad Sector tradition, ranging from pirate radio station test transmissions to a self-built phasing sequencer software. A must. "Massimo Magrini sembra un pirata dell'etere pronto a catturare ogni suono"
"C'è una potenza fisica nelle masse acustiche sviluppate da Massimo Magrini"
"Noise and ambience merge perfectly on this release"
"Retrovirus shows Bad Sector's typical ability to build menacing dark ambient"
"Un lavoro che è in grado di suggestionare l’ascoltatore in mille modi"
"The packaging fools you into believing that this is not a CD-R at all but a digipack CD"